By February 638 there was a lull in the fighting on the Persian front. The Suwad, the Tigris valley, and the Euphrates valley were now under complete Muslim control. The Persians had withdrawn to Persia proper, east of the Zagros mountains. The Persians continued raiding Mesopotamia, which remained politically unstable. 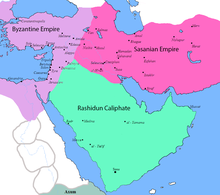 Nevertheless, it appeared as if the Zagros range was going to be the dividing line between the Rashidun Caliphate and the Sassanids. In the latter part of 638, Hormuzan, who was one of the seven great chiefs of Persia, and had commanded a corps at the Battle of Qadisiyyah, intensified his raids in Mesopotamia. Saad, on Umar's instructions, attacked Hormuzan, while Utbah ibn Ghazwan, aided by Nouman ibn Muqarin, attacked Ahvaz and forced Hormuzan into a peace treaty, under which Ahvaz would remain in Hormuzan's possession as a Muslim vassal state and would pay tribute. However, Hormuzan later broke the treaty, leading Umar to send Abu Musa Ashaari, governor of Busra, to deal with him. After another defeat, Hormuzan signed another treaty on similar terms to the last. This peace also proved short-lived once Hormuzan was reinforced by fresh Persian troops sent by Emperor Yazdgerd III in late 640. The troops concentrated at Tuster, north of Ahvaz. Umar sent the Governor of Kufa, Ammar ibn Yasir, the governor of Busra, Abu Musa, and Nouman ibn Muqarin there, where Hormuzan was defeated, captured and sent to Umar in Medina. Hormuzan apparently converted to Islam and remained a useful adviser to Umar throughout the remainder of the Persian campaign. He is also believed to be the mastermind behind Umar's assassination in 644. After the victory at Tustar, Abu Musa marched against the strategically-important Susa in January 641, capturing it after a siege of a couple of months. Next, Abu Musa marched against Junde Sabur, the only place left of military importance in the Persian province of Khuzistan, which surrendered to the Muslims after a siege of a few weeks. After the conquest of Khuzistan, Umar wanted peace. Though considerably weakened, the image of the Persian Empire as a fearsome superpower still resonated in the minds of the newly-ascendant Arabs, and Umar was wary of unnecessary military engagement with it, preferring to leave the rump of the Persian Empire alone, commenting, "I wish there was a mountain of fire between us and the Iranians, so that neither they could get to us, nor we to them." However, Persian pride had been hurt by the Arab conquest, making the status quo intolerable. After the defeat of the Persian forces at the Battle of Jalula in 637, Yazdgerd III went to Rey and from there moved to Merv, where he set up his capital and directed his chiefs to conduct continuous raids in Mesopotamia. Within four years, Yazdgerd III felt powerful enough to challenge the Muslims again for control of Mesopotamia. Accordingly, he recruited 100,000 hardened veterans and young volunteers from all parts of Persia, under the command of Mardan Shah, which marched to Nahavand for the last titanic struggle with the Caliphate. The Governor of Kufa, Ammar ibn Yasir, received intelligence of the Persian movements and concentration at Nahavand and reported them to Umar. Although Umar had expressed a desire for Mesopotamia to be his easternmost frontier, the concentration of the Persian army at Nahavand forced him to act. He now believed that as long as Persia proper remained under Sassanid rule, the raids into Mesopotamia would continue. Hudheifa ibn Al Yaman was appointed commander of the forces of Kufa, and was ordered to march to Nahavand. Abu Musa was to march to Nahavand from Busra, while Nouman ibn Muqarrin marched from Ctesiphon. Umar decided to personally take the army concentrated at Medina to Nahavand to assume overall command. The members of the Majlis al Shura, however, suggested that Umar should command the campaign from Medina, appointing an astute field commander for Nahavand. Umar acquiesced, appointing Mugheera ibn Shuba as commander of the forces concentrated at Medina, and Nouman ibn Muqarrin as commander-in-chief at Nahavand. The Muslim army first concentrated at Tazar, and then defeated the Persians at the Battle of Nahavand in December 642. Nouman died in the action, and, as per Umar's instructions, Hudheifa ibn Al Yaman became the new commander-in-chief. Thereafter, the Muslims captured the whole district of Hamadan, encountering only feeble resistance. After several years, Caliph Umar adopted a new offensive policy, preparing to launch a full-scale invasion of what remained of the Sassanid Empire. The Battle of Nahavand was one of the most decisive battles in Islamic history and proved to be the key to Persia. After the devastating defeat at Nahavand, the last Sassanid emperor, Yazdegerd III, fled to different parts of Persia to raise a new army, with limited success, while Umar attempted to capture him. Umar decided to strike the Persians immediately after their defeat at Nahavand, while he still possessed a psychological advantage. 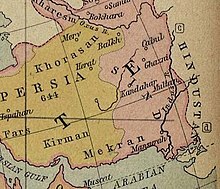 Umar had to decide which of three provinces to conquer first: Fars in the south, Azerbaijan in the north or Isfahan in the center. Umar chose Isfahan, as it was the heart of the Persian Empire and a conduit for supply and communications among the Sassanid garrisons, and its capture would isolate Fars and Azerbaijan from Khorasan, Yazdegerd's stronghold. After he had taken Fars and Isfahan, the next attacks would be simultaneously launched against Azerbaijan, the northwestern province, and Sistan, the easternmost province of the Persian Empire. 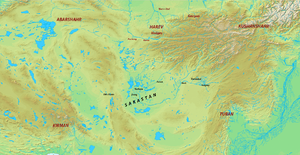 The conquest of those provinces would leave Khorasan isolated and vulnerable, the last stage of the conquest of Sassanid Persia. Preparations were complete by January 642. The success of the plan depended upon how effectively Umar could coordinate these attacks from Medina, about 1500 kilometers from Persia, and upon the skill of his field commanders. Umar adopted a different approach to the command structure. Instead of appointing a single field commander to press the campaign, Umar appointed several commanders, each assigned a different mission. Once a commander's mission ended, he would become an ordinary soldier under the new field commander for the latter's mission. The purpose of this strategy was to allow commanders to mix with their soldiers and to remind them that they are like everyone else: command is only given to the most competent, and, once the battle is over, the commander returns to his previous position. On the eve of the campaign, Umar, in order to boost morale, decided to reinstall Khalid as field commander, four years after his dismissal. 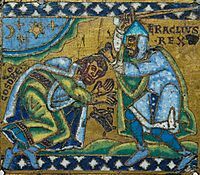 Khalid's reputation as the conqueror of the Eastern Roman provinces demoralized the Persian commanders, most of whom had already been defeated by him during his conquest of Mesopotamia in 633. However, before Umar could issue the reappointment order, Khalid, died in Emesa. Throughout the Persian campaign, Umar even appointed the commanders of the wings, the center and the cavalry of the army. Umar strictly instructed his commanders to consult him before making any decisive move in Persia. All the commanders, before starting their assigned campaigns, were instructed to send a detailed report of the geography and terrain of the region and the positions of the Persian garrisons, forts, cities and troops. Umar then would send them a detailed plan of how he wanted the region to be captured. Only the tactical issues were left to the field commanders to tackle in accordance with the situation they faced at their fronts. Umar appointed the best available and well-reputed commanders for the campaign.